I always think that winter will be slow and lazy and that I will get lots of contemplation and writing done. Well, winter is nearly over and it seems that there has always been so much to do, and weeks go by with not a blog read or entry! After this first year at Greenberry House in a bricks and mortar store, I've decided to convert this little building into a yarn shop, featuring yarns and spinning fiber from quality small producers. A few people have signed up already for booth space, mostly from Virginia and North Carolina. I should have room for about ten vendors and I think this is a unique idea! If anyone is interested just give me a shout! It has finally warmed up enough to shear some rabbits, and I was able to relieve two of their gorgous heavy coats yesterday. Crystal is a very senior doe, but she seems to be in good health. There were a few days last fall when I was worried about her; she seemed a little unhappy. But maybe it was the changing weather because she has had a nice winter and had a terrific clip of gorgous wool. 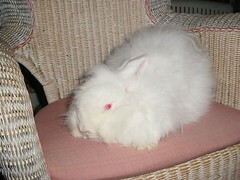 I also sheared Smudge, a black rabbit that came here from Abington, but I forgot to take his picture! 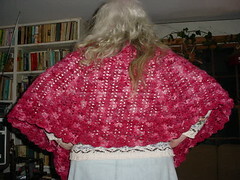 And I finished the special order cape; it's blocking now, which will probably take about a week! I was pleased with how it turned out and hope the customer likes it!